Following the recent full reopening of the reconstructed Wharf Road, certain road haulage operators in the maritime sector are taking actions to boost the benefits of the vital link to and fro the port city of Apapa, easing the nagging Lagos ports access roads gridlock considerably. 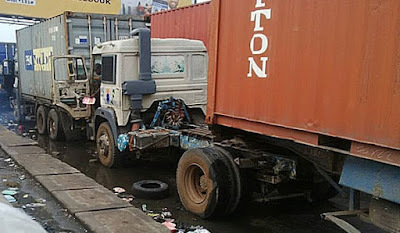 Truckers, under the aegis of the influential amalgam, the Containerised Truck Owners, coupled by the Association of Maritime Truck Owners (AMATO) and Container Truck Owners Association of Nigeria (COTOAN), informed that they are determined to provide efficacious antidote to eliminate the gridlock totally, not just to help their businesses recover from the devastation of the gridlock at its zenith, but to also check driver fatigue and other threats to the health and lives of roadusers, and residents of Apapa and other locations that had been worst hit by the traffic anomaly. The AMATO and COTOAN initiative barred its mind in a statement after a meeting of its leadership at the weekend in Apapa, Lagos State, South-West Nigeria. c. Absence of modern and befitting public terminals, which has seen a large number of truckers without garages parking on the roads and bridges. "However, believing that every problem has solution or expiry date, we have, therefore, resolved to hold the bull by the horn to politely, gently, peacefully, and lawfully relate with relevant authorities to achieve peaceful and enabling working environment." The document noted that the Nigerian Ports Authority (NPA), as the technical regulator of the ports, had informed operators that it has approved the manual call-up of trucks as not just a condition for trucks to access the ports, but also as a method to regulate/control movement of trucks into the ports. "We have, therefore, resolved to imbibe and test-run the system," the AMATO-COTOAN initiative stated. Appealing to all other truckers to give the call-up system a trial, the amalgam stated: "All trucks should leave the roads and wait in their garages until they collect call-up before coming to the roads. "Let's endeavour to submit all required information/documents to facilitate issuance of the call-up. "Enough is enough for all the anomalies on the ports access roads." Harping on the matter of extortionists invading the roads, purportedly collecting membership dues from truckers on behalf of trade unions or/and associations, the statement went on: "On extortion, as a matter of fact, it is we truckers that started and encouraged extortion by bribing our way to make a truck could be number 50 on a queue to shunt to number one position on the line, or to make our trucks to make illegal runs against oncoming traffic and displacing those who have the right of way. We know ourselves in the trucking business, and we know those that initiated the twin evils of extortion and bribery in the system. Those people also know themselves. "To compound it all, some truckers operating as members of certain unions, associations or other bodies started collecting money on the highways under the gaze of security operatives, who subsequently fell under the temptations of the lure of easy money as human beings with money needs. We should, therefore, remove the log in our own eyes so that we can see clearly to remove the specks in the eyes of others. The truth, they say, is bitter. Let's do it right." The AMATO-COTOAN initiative counselled road haulage unions/associations and associated bodies to "fashion a better, modern and acceptable way of funding themselves by doing away with primitive and archaic ways that are not just breeding hooliganism and thugs, but also denting the image of our country". The Containerised Truck Owners further advised that truckers "should endeavour to work towards bringing professionalism to the fore in their work".